Her mother pregnant with the latest of her seemingly endless siblings, Leanbh is sent to live with her aunt and uncle on a farm in Wexford, to help lighten the load on her mother shoulders. At home she had been tasked with chores around the farm, unused to rest or hanging about the house. Yet, the first thing she’s told at her new, temporary home is she’ll be doing none of the outside work. Instead, she’ll stay around the house and help out her aunt. In this short, spare novella Keegan brings out one ordinary Irish country child and two ordinary Irish country families, drawing from their stories the basic truths of life and love. From a life of survival, barely skimping along, to a home full of love, patience and a little money to spare, a little girl gets one peek into how different her life may have been. The end of this book will break your heart. No matter what you expect will happen, Keegan has a deft touch. Her spare, stoic prose is absolutely stunning. A flawless book. 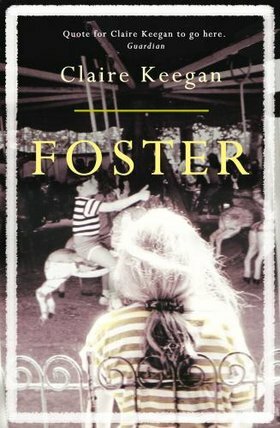 For Foster Claire Keegan won the Davy Byrnes Award, the world’s largest prize for a story. It was previously published, in shorter form, in the New Yorker. I immediately put her other books on interlibrary loan after I closed the cover of this one. She has two previous collections of stories: Antarctica (LA Times Book of the Year, Rooney Prize for Literature) and Walk the Blue Fields (2008 Edge Hill Prize for Short Stories for the finest book of stories in the British Isles). Information about Keegan is sparse. She’s not one to chat on the internet. I found her agent and that’s about it. She’s taught at several universities and won loads more prizes than I included above. And that’s all to be had about her, more’s the pity. Now I’ve found myself in a novella mood and not just Irish novellas, though I have a fondness if you haven’t noticed. I’m romping ’round the internet looking for good suggestions for contemporary books. If you know of any quality novellas please do leave me a comment or email me. I’ve found a few lists but prefer recommendations by those who’ve actually read the books.